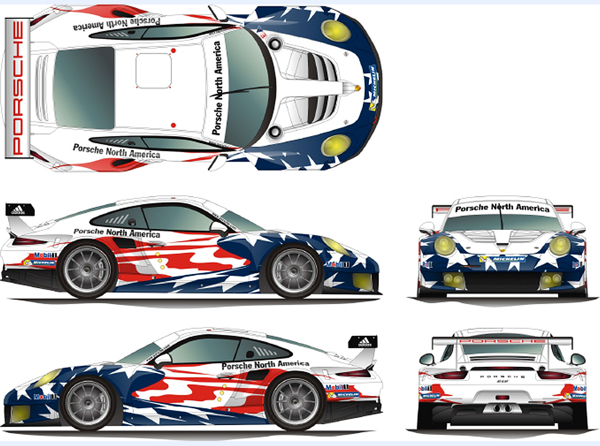 The factory Porsche North America entries will be piloted by works drivers. Next year will see the debut of a factory Porsche sport scar team on the American continent after the announcement that current ALMS team, CORE autosport will field a pair of works Porsche 911 RSRs in the 2014 United SportsCar Championship. Although Porsche assisted Penske with the running of the LMP2 RS Spyders back in 2006-08, the announcement at the Texas FIA WEC round marks Stuttgart’s first factory foray into a North American sports car championship. CORE autosport’s boss, Jon Bennett (second from right) and Hartmut Kristen (far right) announced the deal in Texas. CORE autosport, who has been running a Porsche 997 GT3 RSR for the first time in this year’s American Le Mans Series, will run the duo of 2014-spec 911 RSRs, while the driving duties will be performed by two pairs of as-yet-unnamed Porsche factory drivers. CORE autosport have been running a Porsche 997 GT3 RSR in the 2013 ALMS. The team will be entered under the name of ‘Porsche North America’, and based out of Porsche Motorsport North America’s premises in Santa Ana, California. The first race for the new team (which will be run like the WEC Porsche AG Team Manthey effort) will be the Daytona 24 Hours on 25 January 2014. Competing in the top GTLM (‘GT Le Mans’) class, the Porsche North America team is likely to face stiff competition from American stalwarts, Corvette Racing, as well as BMW Motorsport. The assault on the 2014 USCR Championship will be Porsche’s first North American factory team. Meanwhile, IMSA has announced the dates for the 2014 United SportsCar Championship. The new series will combine the best events from the current Grand-Am and ALMS schedules. The highlights of the 2014 championship include the Daytona 24 Hours, 12 Hours of Sebring, and the Petit Le Mans at Road Atlanta.